Young readers will enjoy following the story of the four little characters, Sniff, Scurry, Hem and Haw, who make their way through a maze looking for the "Magical Cheese" that makes them happy. And once they find the Cheese, it seems like it will last forever-until one morning when everything changes. Who moved their Cheese? Will it come back? Or will they have to look for different Cheese, venturing onto strange paths, around corners they've never explored? As children follow these friends through the maze of change, they can try to figure out which character they're most like-or which they most admire-and what their own Magical Cheese might be. Spencer Johnson, M.D., is the originator of The One Minute Manager System ™ and co-author of The New York Times bestsellers The One Minute Manager ®, The One Minute Sales Person, and One Minute for Myself. 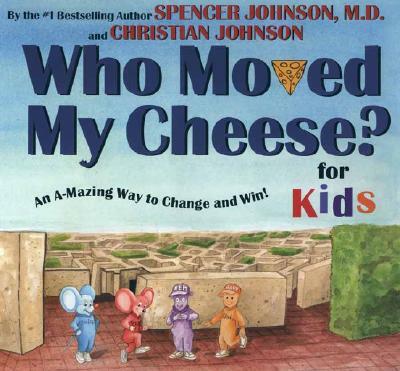 His other bestsellers include Who Moved My Cheese? ; The Precious Present; and Yes or No: The Guide to Better Decisions. He has written more than two dozen books dealing with medicine and the behavioral sciences, and has millions of copies of his books in print in twenty-six languages, including the popular children’s book series ValueTales ™. Dr. Johnson received a B.A. degree in psychology from the University of Southern California, an M.D. from the Royal College of Surgeons in Ireland, and medical clerkships at Harvard Medical School and the Mayo Clinic. He lives with his family in Hawaii.